There has been much said about him. His intractability, his talent, his race, his implosions, even his intestinal disorder as a youngster. The aggregate of such complexities, the everlasting muse for the blogosphere, forums, and youtube, Mario Balotelli, will make his way to Milanello tomorrow to start anew at the age of twenty-two. The debate that everyone has been rehearsing about his move from Manchester City to Milan is hooked to his past because his past on its own could design a curriculum. Balotelli is the ultimate case study, a player who flummoxed Jose Mourinho, prompting the normally resilient Portuguese to label him "unmanageable." He is a player who has inspired stories that bow to his realities. But despite his expansiveness, Balotelli is Balotelli, the perfectly poised reflexive property--it is for the rest of us to figure him out. Not least Milan coach Massimiliano Allegri. When the delirium of Balotelli's 23 million euros move dissipates, the dread will undoubtedly descend. Balotelli is the signal talent of Italy in the striker department, but his talent coruscates only when coaxed, or, perhaps more fittingly, conjured. No one has really been able to figure out lastingly the formula, the incantation. Italy coach Cesare Prandelli managed to do it for transient moments during Euro2012, but sustaining Balotelli and his talent for a season or seasons seems crushingly difficult. Allegri successfully managed Zlatan Ibrahimovic and Antonio Cassano during a Scudetto winning season--not exactly the retiring types. However, Ibrahimovic may have had a difficult character but he was always committed to his teams on the field. And for all of Cassano's problems, he came to Milan at the age of almost thirty. His outburst at the late Riccardo Garrone notwithstanding, Cassano, by his standards, was his own demur version by the time he signed for Milan. Balotelli, however, is still young and unapologetically capricious. While Milan is renowned for having an atmosphere that demands conformity, the task of Balotelli will be the club's and Allegri's toughest assignment. To talk about the potential that a partnership of Balotelli and Stephan El Sharaawy has is intoxicating, especially given the latter's form this season. But to see that potential in kinesis for seasons to come will be the only vindication for Milan. It is simply not enough for Balotelli to spark here and there: the time has come to modulate his talent for longevity. 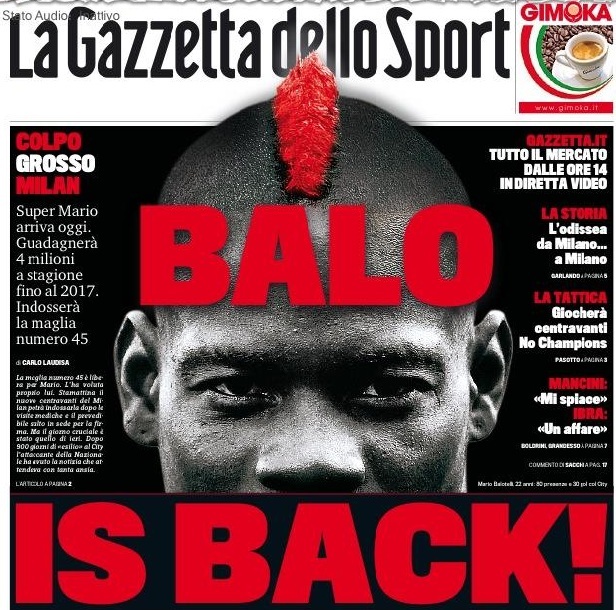 Milan vice-president Adriano Galliani deserves applause for pulling off yet another cut-price deal for a top player, but in Balotelli's case the work has only now begun. I especially agree with one of your points towards the end of the article and I must conclude that Balotelli should not just give it his best as he tends to only do so when he feels like it but he should rather make it habitual. To me, it would be such an utter waste of talent if Balotelli continued in his Man City/Inter ways with Milan because although only 22 this maybe his only real opportunity to get the BEST out of his career, or rather his potential. "...potential that a partnership of Balotelli and Stephan El Sharaawy has is intoxicating..."
Let's hope, on paper it seems so and the fact that they will be the future of Italy attack just makes it even better. Hopefully the fact that Balotelli has been a long time Milan fan will be a factor for him to show invariable respect towards Milan as he does for Italy.. However, we have to factor in that Balotelli playing for Italy is a more sporadic occasion so I'm sure it's easier to behave for a month a year in friendlies and a couple months for major tournaments then it will be for the entirety of a season(s).. Anyhow, I'm not worried if we're to go by any type of evidence that we could change Balotelli, although inductive in essence we have managed to contain Cassano,Ibra,Boateng who are all known for being 'bad boys'.. Moreover, I've noticed that Man City is more of a playground then anything, their players are getting highly paid, the structure of the team is not a very strict one if I go by the man city TV videos I've watched here and there on youtube it's a team with money but no real structure. Milan is a team with a lucrative history and teams like Madrid,Barcelona,Milan don't tend to be shown disrespect by their players, regardless of who they are.. Maybe because so many players that are in their teens and twenties now used to look up to Milan,Barca,Madrid as being a dream to play for. Who knows, but anyways sorry for rambling on I just wanted to give my two cents on the Balotelli behavioral situation.. Yes...this is my reservation too. I think Balotelli will really test our reputation as being the right environment for the poorly behaved. Let's hope for the best!